What is the benefit of Royal Caribbean’s online check-in process? Completing the Online Check-In process for all the guests in your reservation will save you from having to fill out forms at the pier and needs to be completed 3 days prior to your saildate. Royal Caribbean International requires guests to be checked in no later than 60 minutes prior to the scheduled sailing time*. Guests arriving late will not be permitted to sail. This supports government regulations in some ports that require cruise lines to submit a departure manifest 60 minutes prior to sailing. Guests are requested to complete Online Check-In no later than 3 days prior to the cruise in order to expedite the pier check-in process. Once you have completed the Online Check-In process, you will receive a SetSail Pass. It indicates that you successfully completed the check-in process for you and those guests listed on your SetSail Pass. Please manage your reservation and fill out the required fields to start your check-in process. What documents are required to check-in online? Where do I find my cruise reservation documents? If your cruise documents are available, you can access them through your reservation dashboard in your My Cruises Account. If your documents are not yet available, check back soon. You should also receive an e-mail when your documents are ready. Royal Caribbean provides complimentary electronic cruise documents (eDocs) for all guests. You also have the option to request printed cruise documents for $35 per document. Contact us if you require these documents to be reissued. Please note, however, that a reissue fee may apply. Names may be changed up to 24 hours prior to sailing provided one of the original names remains on the reservations. If you reserve your cruise vacation online, you will be given the choice to receive your cruise documents electronically at no charge or by mail for a $35 fee per document. If you choose to receive them electronically, you will receive an e-mail with downloading instructions when your documents are ready. If you choose to receive your documents by mail, they will be printed and sent to the address you provided and a $35 printed document fee will be added to your reservation. If you reserve your cruise with a travel agent or a Certified Vacation Planner, your cruise documents are sent to you (or your travel agent) 20-50 days prior to sailing, assuming your reservation is finalized and your payments have been made. Group documents and those that include air arrangements require additional steps and will be sent within 30 days of sailing. The same options of complimentary eDocs or printed documents for $35 per document are available when booking online, with a travel agent or Certified Vacation Planner. 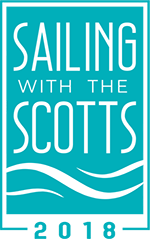 Documentation may not be provided in advance for reservations finalized the week of the sailing – guests will obtain pertinent details at the pier prior to boarding, and once onboard. If you have any questions, please contact your travel agent or Certified Vacation Planner directly. How do I setup a Royal Caribbean SeaPass or Onboard Expense Account? An Onboard Expense Account, also known as your Seapass® onboard account, is the cashless system used for all onboard purchases and services. Depending on your ship, SeaPass cards are handed out at the pier or will be in your stateroom waiting for you. Yes, Royal Caribbean works with cellular networks to provide the ability to connect your device through “cellular at sea”. These roaming rates to utilize your device are determined by your cellular provider. Prior to your sailing, it is recommended to contact your cellular provide for more information on these rates and special packages available. Additionally, another option for staying connected without utilizing your celluar data, is connecting to VOOM, the fastest internet at sea. VOOM allows guests to stay connected via wifi, with a variety of packages to choose from. How do I arrange for babysitters or daycare onboard the ship? Babysitting is offered both in a group setting, and individually in your stateroom. In stateroom babysitting must be reserved through the Guest Relations Desk (Purser’s Desk) at least 24 hours in advance. It cannot be reserved prior to the cruise vacation and there is no guarantee that sitters will be available. The service is offered between 8:00 am and 2:00 am when personnel is available. Sitters will be assigned on a first come first served basis. Children MUST be at least 1 year old. Approximate Rate: $19 per hour for up to three children within the same family. Times and prices are subject to change without notice. Payment will be made using your onboard SeaPass card. Feel free to recognize crew members who make your voyage exceptionally memorable. You can visit the Guest Services desk to increase the amount of your gratuities or reward a crew member with an additional cash gratuity at your discretion. Gratuity envelopes are available in your stateroom. You’ll find a comment card there, too – another way you can provide feedback and recognition for wow-worthy crew members. All shipboard photo products and services musty be either purchased pre-cruise at All professional Photo operations are handled by Image Photo Services on all Royal Caribbean ships. There is no ability to offer post-cruise sales of any photographic products or services. c/o Image Photo Services, Inc.
ll of our Royal Caribbean ships are equipped with North American standard, 110 volts AC and standard European 220/230 volts AC outlets. What kind of shore excursion tours are offered on Royal Caribbean? Adventure Tours – Looking for a real adventure? We’ve got you covered. Horseback riding, mountain biking, parasailing, rain forest hiking, and 4×4 off-roading are just a few examples of what you can do. Beach and/or Water-Related Activities – You’ll find everything from a relaxing day at a secluded beach to active adventures like whitewater rafting. Choose from glass-bottom boat tours, romantic sunset cruises, deep-sea fishing, kayaking and more. Cuisine Tours – Whether it’s tapas tasting in Spain, a pub tour in Ireland, a salmon bake in Alaska or another one of our culinary adventures, these excursions will give you a taste of the local flavor. Flightseeing – Sightseeing from the sky is bound to give you a new perspective. Soar high above exotic waterfalls or take a helicopter ride above ice fields in Alaska. This is truly an amazing way to see the sights. Golf – Tee off on exciting golf courses like the Cozumel Country Club, Bermuda’s Belmont Hills Golf Club, or St. Thomas’ Mahogany Run Golf Course. Shows & Entertainment – Stroll through world-famous museums or sit back and be entertained. Watch native dances in Alaska, enjoy a live mariachi band in Mexico and more. Sightseeing and/or City Tours – Explore the ports of call on your cruise vacation with one of our Sightseeing & City Tours. Whether you’re looking for a guided tour or time to explore on your own, we have something for all ages and interests. Snorkel & SCUBA Tours – Enter the underwater world. Learn the basics of SCUBA, or if you’re certified, sign up for an advanced dive. Not ready for SCUBA? Try snuba, a shallow-water diving system, or slip on a special diving helmet and go Sea Trekking. Wilderness & Wildlife Tours – Get up close and personal with dolphins, manatees, moose, bear, caribou, monkeys and more. We offer tours that allow you to observe them in their natural habitats as well as animal adventure centers. Guests visiting our website who have a cruise booking may view the available shore excursions for their specific sailing by logging in to Cruise Planner. You may also access at Download a Shore & Land Excursions Brochure. Guests can book a Shore Excursion by visiting the Shore Excursion desk onboard during their cruise. Guests may also visit Cruise Planner to purchase excursions before they cruise. How can I buy a Royal Caribbean shore excursion? You may view and purchase available shoere excursions once you’ve reserved a cruise, received your cruise reservation number, and have made at least one payment toward your cruise. You can purchase Shore Excursions before you cruise through our Cruise Planner portal or wait to purchase on board. To shop for excursions prior to booking, visit our Shore Excursions. What activities are available for children and teens cruising with Royal Caribbean? There’s no better way to excite every member of your family than with a Royal Caribbean cruise vacation. We offer a huge variety of activities onboard and excursions on shore, so you can explore and have fun as a group or break out and do the things you each love most. Onboard, our Adventure Ocean Youth Program offers adventure (and education) for kids ages 3-17 with different activities and programs for different age groups. Many of our shore excursions offer the excitement and wonder that appeal to all ages. Be sure to check the descriptions to pick the ones your family will enjoy. For Specialty Restaurants (i.e. Jamie’s Italian and Chops Grille), you can make your reservations online up to 2 days before your cruise begins. Reservations for our Spa and Salon can be made before your cruise or once onboard the ship. If you are interested in these services, please make your reservation as soon as possible – appointments and reservations tend to fill up quickly. Group shore excursion requests may be submitted for groups of 40 guests or more to the email address: groupshorex@rccl.com or faxed to 305-579-0193. For more information download our Group Shore Excursion pdf. If you’re cruising to the Caribbean, Mexico or other warm weather destinations, bring a hat for protection from the sun. If your cruise vacation will take you to Alaska, Canada & New England or Northern Europe, be sure to pack a jacket and several sweaters. Casual: You’re on vacation – relax! Jeans, shorts, tees, tank tops, polos, sundresses and blouses are all the right amount of laid back. Please keep swimwear to the Pool Deck. How do I get luggage tags? North American guests who are qualified and who have received their electronic cruise document (eDoc) and have an assigned stateroom number may request their complimentary luggage tags by logging on to www.RoyalCaribbean.com/eDocs. Once you log-in (by providing your name, booking number, date of departure, ship & sail date), select “request” in the Luggage Tags section of the Cruise Documentation Page to submit. A set of eight complimentary, self-adhesive, printed luggage tags will be mailed via the United States Postal Service to the North American mailing address provided in your request form. The tags are color coded & customized to your ship, sailing date & stateroom. Luggage tags may be requested as soon as you receive your eDoc, up until 14 days prior to sailing. Luggage tags will be available upon arrival at the pier for guests with a guarantee stateroom or for guests who do not submit a request at least 14 days prior to sailing. If you received printed cruise documents for $35 per document, your customized set of luggage tags will be included in your printed document book. What is the dress code onboard all ships? Each guest has the option to carry their luggage on board or check-in luggage prior to boarding. Luggage may include suitcases, trunks, valises, satchels, bags, hangers containing clothing, toiletries and similar items. Here are some recommendations for packing only cruise essentials. We recommend that guests personally carry any boarding documentation such as passports, visas, citizenship documents and family legal documents plus all medications. To minimize the potential for diversion or loss of medications, we advise that all medications remain in their original, labeled prescription containers. It is also advisable to pack at least three days of extra medication in the event of an unexpected change in the itinerary of the voyage. How do I qualify for the Royal Caribbean Luggage Tag Program? Crown & Anchor® Society Pinnacle members. Guests must have their cruise documents available and have an assigned stateroom in their name. Or, if booked under a Guarantee, have been advised on their stateroom assignment and are in possession of their paper cruise documents. Requests for Royal Caribbean’s Luggage Tag Mailer must be made no later than 14 days prior to the sailing date. If the guest is eligible to request luggage tags, they will be able to complete the request via Online Check-in (on the status page) or Countdown to Cruise (on the Guest Documentation tab). How do I request replacement luggage tags from Royal Caribbean? If you forgot your luggage tags at home, ship luggage tags are available from our Porters at the pier on the day of boarding but to avoid any day-of-boarding delays we recommend that you secure your Luggage Tags before leaving home if you are a qualified guest. How do I wire gaming funds for use onboard? Casino players that would like to wire gaming funds for use onboard can follow the wire instructions here. How do I receive a Win/Loss Statement? In order to receive a Win/Loss Statement fill out the information here. We will be opening new attractions and experiences on a tiered schedule. The new pier will open in September 2018. Chill Island and Oasis Lagoon will open in November 2018. Thrill Waterpark and the new South Beach will open in April 2019. And the official Perfect Day at CocoCay Grand Opening, which includes the opening of Coco Beach Club and the Overwater Cabanas, is set for November 2019. Note that any of this is subject to change as it relies on achieving all construction deadlines and does not account for unforeseeable events. What happens if there’s a hurricane predicted at the time of my Royal Caribbean cruise? Can Royal Caribbean change an cruise itinerary? How do I prevent or treat motion sickness or seasickness? FDA-approved acupressure wristbands and various over-the-counter medications and natural treatments can help prevent seasickness, and should be used before you start to feel ill. Consult your physician before choosing to use either. Your location onboard and in proximity to the water can also help. The lower you are to the water line, and the closer you are to the center of the ship, the less movement you will experience. When looking out at the water, keep your sight on the horizon line. Read “The Truth About Seasickness” to learn more on how to prepare properly before you cruise. May I board a Royal Caribbean ship if I am pregnant? Royal Caribbean Cruises Ltd. policy regarding pregnancy is derived from the Cruise Lines International Association endorsement of the American College of Emergency Physicians Health Care Guidelines for Cruise Ship Medical Facilities, which can be found at http://www.acep.org/Content.aspx?id=29980. This includes the guideline that “Pregnant women who have entered the 24th week of estimated fetal gestational age at any time during the cruise should not be eligible to sail with the ship. It is Royal Caribbean Cruises Ltd. policy that any Guest who will have entered her 24th week of pregnancy or greater, at any time during the cruise, will be prohibited from sailing. The Guest and treating physician should consider before any cruise that there is no Obstetrician/Gynecologist available on the ship, and that pregnancies, when unstable and poorly controlled, are potentially life-threatening, especially without back up. A Guest may be at sea for several days without any immediate hospital and/or specialist back up, and that since the proposed itinerary is not within the U.S., and the availability of specialized shore side facilities can be problematic. Is the water on the ship safe to drink? Yes. All drinking water is either distilled from seawater or loaded onboard while the ship is in port. Royal Caribbean adheres to Vessel Sanitation Program standards published by the U.S. Public Health Service (USPHS). The USPHS conducts inspections of the ship, both during its construction and throughout the year, to ensure compliance. Should I be concerned about Zika Virus on my cruise? We make every effort to accommodate our guests’ dietary requirements whenever possible. Kosher for Passover meal requests MUST be received 90 days in advance in order to be accommodated. Contact your travel agent or Certified Vacation Planner and request that the remark be noted in your reservation details. If you made your reservation online at royalcaribbean.com you may add your request to the “update personal information.” section. You may also send an e-mail request to special_needs@rccl.com; please include in the e-mail the guests’ names, booking number, ship name and sail date. E-mails will receive an automated response. We kindly ask that guests do not call Royal Caribbean International suppliers with specific questions. Special meal requests that are received less than 45 days of sailing (90 days for European/Asian itineraries) are dependent on the ship’s product availability. We will try to accommodate to the best of our ability. What is a muster drill on a Royal Caribbean cruise ship? A muster drill is a mandatory exercise with the objective to familiarize all guests and crew with the location (muster station) where they are to assemble in the unlikely event of an emergency. During this drill, additional safety information (i.e., how to don a life jacket) is presented. Do I have to attend the Royal Caribbean’s pre-departure muster drill? The pre-departure assembly muster drill is a coast guard regulatory requirement and all guests must attend even if they have sailed previously. If you have a medical condition that impacts your ability to stand please let our crewmembers know and they will arrange for you to participate in the most comfortable possible way. What is the timing of the muster drill for Royal Caribbean guests? The International Convention of Safety of Life at Sea (SOLAS) regulatory guidelines require that a muster drill be held within 24 hours of a ship’s departure from its embarkation port. The muster drill for guests on all ships across our fleet is to be held 30 to 60 minutes prior to departure on the day of turnaround, or embarkation. Do Royal Caribbean passengers have to wear a lifejacket when participating in the muster drill? What languages are the Royal Caribbean muster drills conducted in? Is there a licensed medical staff onboard? We have a minimum of one fully licensed physician, and a minimum of two licensed nurses onboard every ship. Does Royal Caribbean supply oxygen onboard the ship? Guests taking an oxygen cylinder or concentrator while on tour should provide in advance the dimensions of the device (Length x Width x Height to Accessible Shore Excursions. Please include this information in the Accessible Shore Excursion Form and sent to shorexaccess@rccl.com. This information will ensure special accommodations are in place. If the main electrical power source is lost, we have plans for a contingency and we move to using the emergency generators. These are typically located on the upper decks and they have their own fuel supply and are completely independent. The generators can provide emergency lighting, fire detection systems, operate elevators and even provide power to re-start the engines, if necessary. They can also power communication channels – radio, telefax, email, so the ship can continue to communicate with shoreside. Are there additional gratuities on the cruise? A 18% gratuity is automatically added to Spa & Salon services. A 15% gratuity is also automatically added to bar service beverages, mini bar items. These gratuities may be itemized on your receipt. What items are prohibited onboard a Royal Caribbean cruise ship? Candles, Incense, Coffee Makers, Clothes Irons, Travel Steamers & Hot Plates. (Items that generate heat or produce an open flame. This includes heating pads, clothing irons, hotplates, candles, incense and any other item that may create a fire hazard. NOTE: The only exception to this policy are curling irons and hair straighteners. Matches and normal lighteners are allowed onboard. However “”torch lighters”” and novelty lighters that look like guns are not allowed onboard. Torch lighters emit a powerful concentrated flame, and therefore are prohibited. Yes. Guests are welcome to bring drones on their cruise for use on land only and outside of the port area. However, drones are not to be operated onboard the ship at any time, nor on Royal Caribbean’s private destinations: CocoCay, Bahamas or Labadee, Haiti. What is the legal drinking age onboard a Royal Caribbean cruise ship? Effective immediatly on all sailings, the minimum drinking age for all alcoholic beverages on all Royal Caribbean International is as follows. The minimum age to consume alcohol on Royal Caribbean International ships on sailings from South America, Europe, Asia, Australia and New Zealand is eighteen (18). The minimum age to consume alcohol at all private destinations remains twenty-one (21) without regard to where the sailing originated. Is smoking permitted in Royal Caribbean’s casino? Yes. During operating hours, the Casino will allow smoking, with certain areas designated as non-smoking. Where can I smoke on a Royal Caribbean cruise ship? Indoor smoking is permitted in the Casino, the cigar clubs on Freedom and Voyager Class ships, and one designated smoking venue on ships sailing from Chinese homeports. Outdoor smoking areas will be designated on the starboard side of all ships; with the exception of Oasis-class ships that will allow smoking on the port side of the ships. Am I allowed to bring alcohol onboard a Royal Caribbean cruise ship? Guests are not allowed to bring beer, hard liquor or non-alcoholic beverages onboard for consumption or any other use. Guests may bring personal wine and champagne onboard only on boarding day, limited to two (2) 750 ml bottles per stateroom. Additional bottles of wine beyond two (2) bottles that are brought onboard or any alcoholic beverages purchased in ports-of-call or from Shops On Board will be stored by the ship and delivered to your stateroom on the last day of the sailing. Alcoholic beverages seized on embarkation day will not be returned. Security may inspect containers (water bottles, soda bottles, mouthwash, luggage etc.) and will dispose of containers holding alcohol. Guests who violate any alcohol policies, (over consume, provide alcohol to people under age 21, demonstrate irresponsible behavior, or attempt to conceal alcoholic items at security and or luggage check points or any other time), may be disembarked or not allowed to board, at their own expense, in accordance with our Guest Conduct Policy. Guests who are under the permitted drinking age will not have alcohol returned to them. Please Note: All guests must comply with TSA guidelines for transporting liquids. Guests are allowed to bring two additional 750 ml bottles of wine or champagne per stateroom, for each individual sailing, when sailing on consecutive cruises. Additional bottles beyond two, will be stored by the ship and delivered, two bottles at a time, to the stateroom on the first day of each new voyage. Guests bringing four bottles at the start of the first sailing should have documentation for both sailings available to share with security. Does Royal Caribbean charge a corkage fee? Yes. Guests who consume their personal wine and champagne in public areas, will incur a $15 corkage fee per bottle. Guests wishing to bring personal wine and champagne onboard may do so only on boarding day, limited to two (2) 750 ml bottles per stateroom. No beer or hard liquor may be brought onboard for consumption. Additional bottles of wine beyond two (2) bottles that are brought onboard or any alcoholic beverages purchased in ports of call or from onboard shops during the cruise vacation will be stored onboard and delivered to guest staterooms on the last day of the sailing. What is Royal Caribbean’s International Age Policy? No Guest younger than the age twenty-one (21) will be assigned to a stateroom unless accompanied in the same stateroom by an adult twenty-one (21) years old or older. A guest’s age is established upon the first date of sailing. Can I bring an iron or clothes steamer onboard a Royal Caribbean cruise ship? Irons and clothes steamers are prohibited items and should not be brought with you on your vacation. What is Royal Caribbean’s smoking policy? Smoking is not permitted inside any stateroom and any stateroom balcony. This applies to all stateroom categories onboard. If a guest is in violation of this stateroom policy, a cleaning fee of $250 USD will be applied to their SeaPass® account and may be subject to further action pursuant to the “Consequences Section” of the Guest Conduct Policy. Where does Royal Caribbean get the foreign exchange rates used onboard? Royal Caribbean uses daily market rates published by Bloomberg, a reputable, New York-based financial service company. For each purchase made onboard the ship you will receive a receipt at the point of sale. A final statement will be delivered to your stateroom on the final morning of your cruise vacation for your review. Please note all onboard prices are in USD. What kind of food or drinks am I allowed to bring onboard a Royal Caribbean cruise ship? One of the best things about cruising is the food! And there will be many dining options available to suit most tastes and preferences. However you are free to bring non-perishable prepackaged food in limited quantities. What is a Meet & Mingle event? A Meet & Mingle is a fun and memorable opportunity for guests who have been corresponding online at Cruise Critic website to meet face to face. Royal Caribbean provides a private room, complimentary cold hors d’oeuvres, and non-alcoholic drinks, as well as a bar where guests can purchase other beverages. What are the requirements for holding a Meet & Mingle? Are children allowed at the Meet & Mingle? Dect phones (portable phones) are available to rent for $25.00 a week on Radiance and Voyager class vessels. Guests may reserve a set at the Guest Relations Desk, (price is subject to change). Guests are also allowed to have two-way radios, more commonly know as walkie-talkies, for onboard personal communications. Basic specifications are as follows: Up to 10-mile coverage range, Up to 5 watts power, Internal Voice, Operated Transmission, No external mounting antenna. Are there activities for kids and teens onboard Royal Caribbean ships? Please be advised that Driver’s License or Passport as well as Social Security Number will be required to be presented at time of payment. Do I need to bring cash or do you have ATMs onboard the ship? You are certainly welcome to bring cash to enjoy your vacation experience. There are ATM services onboard and limited currency conversion services. There is a withdrawal fee to use the ATMs onboard. When can I board a Royal Caribbean cruise ship? The boarding time for your ship and sailing date is specified in your Guest Vacation Documents. Please do not plan on arriving at the pier prior to the specified time as the ship will not be ready to board guests. How do I track down a lost or left behind item on a Royal Caribbean cruise? How can I communicate on a Royal Caribbean cruise with friends at home or ashore? You can make ship-to-shore calls from your stateroom, 24 hours a day. The cost is $7.95 USD per minute and will be automatically charged to your SeaPass account. Your friends and family can contact the ship by calling (888) 724-7447. Or from outside the U.S. they can call (321) 953-9003. The cost is $7.95 USD a minute and can be charged to their MasterCard® or Visa®. From outside the U.S. additional long distance charges will also apply. You can also use our onboard Internet Cafés, stateroom Internet connection, or Hot Spots to send an e-mail to your friends or family for a minimal fee. What happens if an item I’ve brought is prohibited onboard Royal Caribbean cruise ships? If you bring an item that is on the prohibited items list that is on our website the items will be confiscated. Depending on the circumstance the item will either be disposed of or returned at the end of the voyage. What happens if items in my luggage are identified as prohibited during Royal Caribbean’s security screening? How do I book rooms for my group? They can contact our team for assistance. Our toll free number is (800) 465 – 3595. A group number will be assigned during the initial call. Do I need to provide proof of a disability to reserve an accessible room with Royal Caribbean? Do I need to provide Royal Caribbean with advance notice that I have a disability? What are the requirements for guests traveling alone with disabilities on a Royal Caribbean cruise ship? Please see our full policy regarding Fitness to Travel Safely in our Guest Conduct Policy. How does Royal Caribbean support cruisers traveling with Autism? Autism on the Seas certifies Royal Caribbean with an Autism Friendly Certification for their efforts to ensure their products and services are accessible for inclusion and participation by the autism and developmental disability community. Autism Friendly Certification includes achievement in up to seven areas, such as cruise line staff training, youth program services, pre-vacation planning and services, dining and dietary needs, disability accommodations, guest satisfaction and feedback, and support for “Cruises with Autism on the Seas Staff.” There are four levels of certification, each progressing with increased levels of staff training. Families with autism sailing on Royal Caribbean’s Autism Friendly Certified ships can be confident that Royal Caribbean has autism friendly products and services that will help accommodate family members with autism. Does Royal Caribbean provide wheelchairs or scooters on or off the ship? Are service animals allowed onboard a Royal Caribbean cruise ship? Guests traveling with a service animal should contact Accessible Shore Excursions to review guidelines and arrange special accommodations on tours. Does Royal Caribbean provide Braille formatted material onboard the ship? No, however we provide Qualified Readers onboard our ships for guests who are blind or have low vision. Select crewmembers have been trained as qualified readers to read written material such as the daily Cruise Compass and shore excursions information. Waiters will also read dining menus upon request. To request qualified readers for your cruise, please contact Guest Relations upon boarding. Due to the historical nature of the sites and venues at some ports of call as well as the uneven terrain, inclines, steps to negotiate and narrow sidewalks not all tours offer access to wheelchair/ scooters. “Accessible tours” are tours designed for full time wheelchair users or guests unable to negotiate motor-coach steps. They are available in certain ports based on the transportation we have been able to secure. How do I enroll in the Crown & Anchor Society? If you are a new guest, there is no need to sign up for Crown & Anchor Society. You will be automatically enrolled after you complete your first sailing with Royal Caribbean International (applies to US Residents). Membership benefits begin after you have completed at least one Royal Caribbean International cruise. If you have sailed with us but are not yet enrolled, you can contact Crown & Anchor Society at (800) 526-9723 to sign up before your next cruise. If you are outside the U.S. and Canada, call (541) 285-9723. Hours of operation are Monday through Friday, 9 AM-10 PM EST and Saturday through Sunday 9 AM-8 PM EST. Please be sure to have information about your previous cruise(s) on hand: ship name(s), sail date(s), and booking number(s). You can also visit the Loyalty Ambassador onboard to sign-up for the program. Benefits begin after you have completed at least one Royal Caribbean International cruise. If your email address is given, we will use this to only communicate your Program benefits unless you opt-in to other solicitations. Cruise Points are the way you earn membership status in the Crown & Anchor Society. You can earn one Cruise Point for every cruise night you sail with us, and DOUBLE the points when you purchase a suite. For instance, if you complete a 7-night cruise, you’ll earn 7 Cruise Points, and when you purchase a suite you’ll earn 14 Cruise Points. Further terms and conditions apply. Points are not recorded or applied until after you complete your sailing. For example, if you are graduating from Gold to Platinum tier level on your current sailing, you will not receive Platinum level benefits until your next sailing. What are the benefits of the Crown & Anchor Society loyalty program? Once you have completed your first cruise and become a Gold Tier Crown & Anchor Society membership entitles you to many exclusive benefits – from special savings on cruise vacations to exciting onboard offers on spa services, casino visits, and much more. Our members get extra amenities, cruise planning benefits and onboard events. Plus, the more you cruise, the more benefits you’ll receive. Check out the full list of benefits at our Crown & Anchor Society section online. To ensure you receive all the benefits you deserve, it’s important to always provide your Crown & Anchor Membership Number when reserving your cruise. If you are currently a member of each loyalty program, you will automatically receive benefits based on your membership level between each. For instance, if you are a Crown & Anchor Platinum or Emerald member and a Captain’s Club Classic member, you will be automatically be entitled to the Select level in the Captain’s Club and Explorer in Le Club Voyage . If you are a Diamond or Diamond Plus member; you will automatically receive equivalent recognition as a Captain’s Club Elite member and Discoverer in Le Club Voyage. The benefits of the programs will stay independent, and the number of sailings a member accrues on each brand will not be combined. You will earn the Cruise Credit or Cruise Point for the brand you are sailing as long as you are a member of that brand’s loyalty program. If you are a Platinum, Diamond or Diamond Plus member in the Crown & Anchor Society but not a member of the Captain’s Club or Le Club Voyage and plan on sailing on Celebrity Cruises or Azamara Club Cruises, respectively, call the Loyalty Service Center at (800) 526-9723 to enroll for equivalent recognition. And please remember to provide your Membership Number whenever you reserve a cruise vacation to receive all the benefits you deserve. What amenities are included in the Concierge Club service for qualifying Crown & Anchor members? Diamond Plus and Pinnacle Club members of the Crown & Anchor Society and guests reserved in our Suites (excluding Junior Suites) can take advantage of the Concierge Lounge. Business services (assistance with faxing or copying – there is a fee for faxing and copying). and from 5:00 pm – 8:30 pm. The Concierge Lounge is designated as a smoke-free area. We respectfully request that guests observe a Smart Casual dress code when visiting the Lounge (no swim or pool attire is allowed, footwear is required at all times). Guests 21 years and younger must be accompanied by a parent or guardian at all times. Please Note: On Freedom-class ships, Diamond-level and above Crown & Anchor Society members have exclusive access to similar amenities in The Diamond Club. Due to the size of the Lounge, we regret that we cannot honor requests for entrance to friends or relatives of eligible guests. It’s important to always provide your Membership Number when reserving a Royal Caribbean cruise vacation. Remind your travel agent to include it. After all, your Crown & Anchor Membership Number is the only way we can make sure you receive all the recognition and benefits you deserve. So if you forget to include your Membership Number when making a reservation, you should bring it with you and provide it to the Loyalty Ambassador when you’re onboard the ship. Your tier will be automatically printed on your SeaPass card if your number was included when making your reservation. What are the Diamond Lounge access benefits for Royal Caribbean Diamond members? For Diamond members sailing on Freedom and Oasis class ships as well as Radiance of the Seas, the Diamond lounge will continue to be open during regular hours with the Diamond lounge concierge at your service. If there are any changes to the time or location, the Loyalty Ambassador will announce these changes in the Welcome letter to be placed in your stateroom on the first day of the cruise. We now offer either the Diamond Lounge or a Diamond Event on every ship in our fleet. On ships with a Concierge Lounge, it will be limited to Diamond Plus and Suite guests (excluding Junior Suites). Due to the size of the Lounge, we regret that we cannot honor requests for entrance to friends or relatives of eligible guests. The Lounge is open twenty-four hours a day. Guests utilize their Gold SeaPass Card to enter the Lounge. Eligible guests receive a letter on boarding day describing the services and amenities available within the Lounge. A Concierge is available in the Lounge daily from 8:30 am – 11:30 am and from 5:00 pm – 8:30 pm. Times may vary by itinerary. The Concierge Lounge is designated as a smoke-free area. We respectfully request that guests observe a Smart Casual dress code when visiting the Lounge (no shorts, swim or pool attire is allowed, footwear is required at all times). Open to guests 18 years of age and older. When you reserve your cruise with Royal Caribbean, we can also handle your air arrangements. Our air arrangements offer a seamless, worry-free way to get from your home airport to the cruise ship and back again. Using Air2Sea gives you the ability to choose from thousands of published and contracted fares. You select the airline, price and schedule that works best for you – all provided to you via an easy-to-navigate Web site. The guest’s airport and travel dates will automatically populate when Air2Sea is accessed with the cruise booking number. The information can be adjusted based on the guest’s individual needs. Royal Caribbean Cruises International’s air program provides you, our valued guests and travel partners with the option to purchase air accommodations via our interactive website. Our air travel offers a seamless, worry-free way to purchase flights in conjunction with your cruise reservation. With Air2Sea you select the airline, schedule and price that works best for you! Quench your thirst onboard with a beverage package that gets you the best value on your favorite drinks, from Coca-Cola® to fine wine, premium and frozen cocktails to a full selection of beers, fruit juices to Evian® water. Purchase onboard or pre-reserve before you set sail. The beverage packages are honored at any of our bars or lounges, Windjammer Café, Main Dining Room, and our private destinations during normal business hours. Room service and minibar are not included. You can visit our Beverage section or if you are booked, visit Cruise Planner for more information and to pre-purchase. The all-inclusive beverage packages are sold onboard all sailings. Onboard, the all-inclusive packages are available for purchase throughout the voyage with at least 4 days remaining. Must be purchased for the duration of the cruise; prorated price based on date of purchase. Any guest wishing to purchase an alcoholic beverage package must do so for all guests of legal drinking age in the same stateroom, for sailings on or after December 31st, 2017. All other beverage packages can be purchased by individual guests, however all packages are for single guest use and cannot be shared by multiple people. The Water Package is an option for guests sailing with Royal Caribbean to order water in various package sizes at a discounted price. The Water Package will be delivered to your stateroom on the date you request. You can choose between 12 or 24 one liter bottled water packages. The fountain soda package entitles you to unlimited refills at any of our bars or lounges, Windjammer Café, Main Dining room, and our private destinations. A complimentary Coca-Cola® souvenir cup is included as part of every fountain soda package. The cost of a fountain soda package is determined by the length of your stay, with an average daily cost of $8 plus gratuity. If you lose your Coca-Cola® souvenir cup, you’ll need to reach out to the bar manager or assistant bar manager and purchase a new souvenir cup for $4.95. The Coca-Cola Freestyle machines require the Coca-Cola souvenir cup to operate. Souvenir glassware is excluded from the all inclusive beverage packages. You may purchase a beverage package up to 72 hours before you sail, online at Royal Caribbean’s Cruise Planner. Or you may purchase it onboard, on the first day of your cruise. Ask at any bar for more information, or look out for a table setup promoting the packages once you board. A sticker will be placed on your SeaPass® card for identification. The bar staff will request to see your SeaPass for verification prior to service, so keep it handy. Can I order multiple drinks at a time with Royal Caribbean’s all-inclusive beverage packages? Are there any gratuities included in the Royal Caribbean beverage package? A service charge of 18% has already been included in the purchase price. You will not have to pay additional gratuities unless you desire to do so. Orders can be canceled through Cruise Planner up to 2 days before the sail date are 100% refundable. Once onboard, refunds will be credited to the guest’s folio account. Any partially consumed portion of the package will be charged at full price. All of our accommodations are designed to be comfortable places you can kick back and relax in after a day of adventure. Our staterooms and suites vary by ship, but every room offers a television, telephone, private bath, shower, vanity and a hair-dryer. And depending on your stateroom/suite category, you’re accommodations many include other amenities such as bathrobes, sitting areas, even a whirlpool tub! Currently, only up to 4 staterooms can be reserved through our online booking system. If you would like to make a group reservation for more than 4 rooms, please call our customer service agent line, or work with a local travel agent. The minimum requirement for a group reservation, is 8 staterooms. A group number will be assigned during the initial call. Our toll free number is (800) 465 – 3595. How can I change or upgrade my room on a Royal Caribbean cruise? Because of the popularity of cruising almost all our rooms are occupied. It is very unlikely to be able to change or upgrade your room onboard. It is strongly recommended that you book the category of room you wish to enjoy during your cruise vacation. If a stateroom is available for a complimentary upgrade, and it meets your upgrade preferences, we will notify you at your email address on file to communicate the upgraded stateroom details. Should you wish to change your room before your sail date, please call one of our customer service agents at 866-562-7625. They will do the best to accommodate you. Safety Deposit boxes are available fleetwide on Royal Caribbean vessels. They are available at the Guest Relations (Purser’s) Desk. This service is free of charge unless the key is lost. A nominal fee will apply for any lost keys. Safety deposit boxes are available on a first come first serve basis. We also run wash and fold specials during the voyage. This is an additional service offered beyond our regular laundry service. Guests can now send smaller clothing items to be washed and folded for the fixed amount of $34.99 per bag. Fit as much as you can into the bag provided for you and we’ll take care of the rest. Please ask your stateroom attendant for more information. Availability may vary. Options abound in the Windjammer Café – perfect for a quick lunch or a casual meal. Our Specialty Restaurants – like Chops Grille – offer amazing food in a restaurant atmosphere. If you’ve got a sweet tooth, grab a scoop at Ben & Jerry’s or a creamy shake at Johnny Rockets – our lively onboard diner. Room service is available any time of the day or night – simply order from the room service menu located in your stateroom/suite (service charge of $7.95* applies). An 18% gratuity is additional and will automatically be added to your check. Our new room service menu features several upgraded selections including a Wagyu Beef Hamburger, Philly Cheesesteak and Grilled Salmon with Cucumber Mint Yogurt and Roasted Asparagus. Menus are available for each restaurant on your cruise ship. The Main Dining Room will continue to offer a different dinner menu each evening so guests can experience varying selections on the menu each night. Simply select your Cruise Ship to check out all the things to do on board, including perusing the menus of your favorite dining locations. 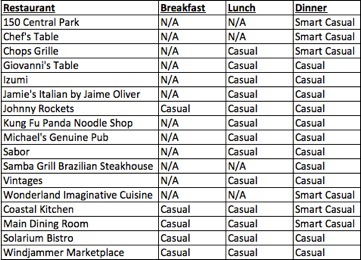 Unfortunately, due to the limitations of the Specialty Restaurants’ galleys, we cannot customize the offerings in these locations. We can accommodate most special dietary requirements in our main dining room where there is a greater degree of control over the production and service of special meals. All dining packages can be purchased onboard or after payment applied toward a reservation; however, availability for the packages is limited so we suggest they are purchased precruise (through the Cruise Planner) to have the best selection of dining times. Dining packages include a restaurant reservation on the first day of the cruise so they must be purchased prior to 5 p.m. on the first day of the cruise. Can I cancel my dining package? Guests may cancel via Cruise Planner. Cancellations made at least 4 days prior to boarding will be refunded to the credit card used for payment. Cancellations made within 4 days of boarding or after departure will be credited to your shipboard account. Cancellations with less than 24 hours notice will be charged a minimum of $10 USD. Specialty Restaurant Cancellations can be made in Cruise Planner at least 4 days prior to boarding will be refunded in full to the credit card used for payment. Within 4 days of boarding, cancellations must be made on board after departure and will be credited to your shipboard account. Cancellations with less than 24 hours notice will be charged a minimum of $10 USD. Yes, gratuities are included in all specialty restaurant cover charges and dining packages. Dining packages do not include beverages. Beverages will be charged separately at regular price. If you would like to book a dining or beverage package, visit Cruise Planner before your cruise. Join our cast of characters for a night of mystery, intrigue and lots of laughs. Our professional cast will host an evening of theater where you are the detectives. Solve the crime over an exquisite four-course dinner paired with fine wine and fun for all. Ships with Giovanni’s Table, depending on which venue is available on the select ship, given an itinerary of 7 days or more offer Mystery Dinner, however black-out dates apply to some sailings. VOOM is available onboard all ships fleetwide. Prices for internet access vary and are subject to change. Log on to the to the network “”royal-wifi”” using your device, open your browser and follow instructions to log on. Is wifi available for all my devices on a Royal Caribbean cruise ship? Whether you have your phone, tablet, or laptop, VOOM the fastest internet at sea allows guests to stay connected. VOOM is available onboard all ships fleetwide. Prices for internet access vary and are subject to change. 1. Connect to “royal-wifi ” on your device. 2. Open your internet browser and register for the package of your choice. 3. Enjoy the fastest internet at sea! VOOM is the name of our high speed internet service, the fastest internet at sea. With the installation of VOOM, you are no longer confined to a specific location on the ship to have connectivity. You can now stay connected from the comfort of your own stateroom, while you lounge by the pool and even while having a drink at the Schooner Bar. The cost of VOOM varies by the number of devices and the service package purchased. We recommend that guests purchase VOOM precruise to enjoy the biggest discount from onboard prices. Simply log in to My Cruises, and go to Cruise Planner. How can I purchase VOOM internet before my cruise? We recommend that guests purchase VOOM precruise to enjoy the biggest discount from onboard prices. Simply log in to My Cruises, and go to Cruise Planner. Price of VOOM varies by the number of devices and the service package purchased. How fast is Royal Caribbean’s VOOM wi-fi internet connection on board? VOOM is 6x faster than any other internet at sea! For the first time you will be able to stream music and movies, upload pictures, video chat with family and friends using FaceTime or Skype, check your email, look your stock prices, surf the web and stay connected with work. Royal Caribbean is the only cruise line with high speed internet at sea. Each one of our VOOM ships gets its signal directly from a satellite beam dedicated to our ships that orbits close to the Earth allowing us to offer fast and reliable service. Given the events over the last few years, having the proper travel documents has been a considerable concern of many guests prior to enjoying a carefree vacation. Passport, visa and inoculation regulations may vary by destination and may change from time to time. For your protection, we recommend that your passport expiration date not occur within six (6) months of the sailing termination date. It is the sole responsibility of the guest to obtain and have available when necessary the appropriate valid travel and health documents such as passports, visas, vaccination certificates, etc., that are necessary for air travel, disembarkation at the various ports of call and re-entry into the appropriate country of origin. Based on nationality, many countries still require an entry visa. It is the guests’ responsibility to identify and to obtain all the necessary visas before commencing their cruise. If your sailing includes a stop in Egypt, a visa is required for many nationalities including US and Canadian citizens, but may not be the only visa required for these sailings based on your nationality. (1) U.S. Citizens can visit the U.S. Department of State Foreign Entry Requirements. (2) Canadian citizens can visit Foreign Affairs and International Trade Canada. Note: All guests going ashore (even guests on shore excursions) must provide a photocopy of their passport details (page with picture and personal information) to the Russian Immigration Officials. Guests who purchase any available shore excursion or arrange for an independent car or van organized through Royal Caribbean Cruises in St. Petersburg will not require a visa for Russia. Under such conditions, guests will need to present (a) a valid passport (b) a Royal Caribbean Cruises tour ticket and (c) one photocopy of passport page showing guest picture and personal information to the Russian Immigration officer as they depart the ship. However, please note that without a visa, visitation is limited to the period of the excursion and you will not be permitted to leave the ship outside of the tour hours without a Russian Tourist Visa. Guests who wish to sightsee independently or sightsee outside of Royal Caribbean Cruises’ shore excursion hours MUST obtain an individual Russian Tourist Visa before leaving home. Russian Tourist Visas cannot be issued during your cruise. Guests who have not purchased a shipboard organized shore excursion and do not possess a valid Russian tourist Visa will not be permitted ashore in St. Petersburg. Guests with an Individual Tourist Visa must present (a) a valid passport (b) Russian Tourist Visa (c) one photocopy of passport page showing guest picture and personal information and (d) a confirmation letter or voucher from your Russian tour company sponsoring your Russian Tourist Visa to the Russian Immigration Officer as you depart the ship. Should you wish to obtain an individual Russian Tourist Visa, you will need to be sponsored by a licensed Russian Tour Company. This company will have to create a program and provide a voucher to the guests confirming all the arrangements along with a reference letter which includes a visa reference number. Once a visa has been issued, it needs to reference the same Russian tour provider as the voucher confirmation. A Russia Tourist Visa will not be accepted by the Russian Immigration official as valid without a confirmation voucher for pre-arranged services. 1) The tour provider needs to be licensed to operate in Russia and authorized to provide services to foreign visitors. 2) The tour provider must be authorized to issue Russian visa reference numbers. 3) The tour provider should be authorized and have a permit to meet the guest inside the Port of St. Petersburg. If the tour provider is not authorized to enter the port area, you will be advised to meet them at the port entrance, which is located approximately 3 miles from the ship. The Russian Tourist Visa issued and stamped on your passport will only apply to the referenced tour company, the person named on the visa and for a specific travel date. The sponsor of each tourist visa is legally required to be the provider of services for the guest named on the visa and will have their license revoked if a visa holder is found ashore without a pre-arranged activity. The above requirements are subject to revision at any time without prior notification to the cruise line. Once onboard the ship, adjustment to the current regulations will be provided as we receive them from the Russian officials. Please also be aware that these regulations can also be at the discretion of the individual officers on duty on the day of arrival and may vary at any time. Guests will be able to secure visa onboard the vessel for a one-time fee of less than $50 per person which will be charged to their onboard account. Ship personnel will assist each guest required to secure a visa for Cambodia and Vietnam and charge the guests onboard SeaPass® account a one-time nominal fee. These visa fees include a small processing charge by our local representative. We recommend that all guests, regardless of their sailing date check with their health care professional or a Travel Medicine Specialist certified by the WHO for guidance. Other informational resources can be accessed at the Centers for Disease Control Traveler’s Health website. As detailed in our brochure, all guests must ensure that they are medically and physically fit for travel. The Centers for Disease Control (CDC) and the World Health Organization website. (WHO) provide guidelines as to which vaccinations are required in each country. In many cases inoculations are recommended, but in some circumstances they are required. For US Sailings – US Citizens need a copy of their official Birth Certificate and a supporting Government Issued Photo ID, Hospital Birth Certificates are not accepted (baby feet Birth Certificates). We highly recommend guest sail with their valid US Passport with 6 months validity past their cruise. For International Sailings- US Citizens require a valid Passport and the corresponding visa required for entry and exit from the country. For US Sailings: Canadians will require their passport with a minimum of 6 months validity post the return of your sailing. For International Sailings: Canadians will require their passport and any applicable visas that are required for entry and exit from the country. For US Sailings- Non-US Citizens will require a passport and the necessary visa for entry into the United States. On Transatlantic and Transpacific sailings European and Chinese guests will require ESTA (Europe) and EVUS (China). For International Sailings – Non-US Citizens will require a passport and the supporting visa for entry and exit from the country, if applicable. A U.S. citizen under the age of 16 will be able to present either an original, notorized or certified copy of his or her birth certificate, a Consular Report of Birth Abroad issues by DOS, or Certificate of Naturalization issued by U.S. Citizenship and Immigration Services. Note: Baptismal papers and hospital certificates of birth are not acceptable. Voter registration cards or Social Security cards are not considered proof of citizenship. Booked guests should review this Printable document to ensure proper preparation for your cruise. Gathering Documents: Make sure you have the proper forms of identification needed for your cruise. Give yourself plenty of time to obtain or renew your passport, if necessary. In order to make the boarding process as simple as possible, we strongly encourage you to visit RoyalCaribbean.com/onlinecheckin to check in online and print your SetSail Pass no later than three days prior to your sail date. Before You Board: Don’t forget to hand carry your passport, SetSail Pass, valuables and medications in your carry-on bag. You’ll need your passport and SetSail Pass to board the ship. Getting To The Ship: Let us take you from airport to port with our “Transfers” program. “Transfers” may be included with our Air2Sea or Hotel offerings. You can also purchase this service separately. Boarding The Ship Please refer to your SetSail Pass for specific check-in times. When should I arrive at the Royal Caribbean cruise port terminal? Guests should arrive to the port no later than 60 minutes prior to the published sail time. Guests should adhere to the published check-in windows, where applicable, that can be found in their E-docs (electronic documents). If you choose to fly ChoiceAir, Royal Caribbean automatically displays only the airline schedules that will enable you to meet your cruise. For your return home, you have the ability to select the flight that best suits your schedule. Depending on your disembarkation time and port, the time needed to arrive at the airport will vary. Yes, all ports have transfer services to and from the airport at an additional fee. When purchasing your airline tickets with ChoiceAir, cruise transfers are provided as an option on the guest preference page. If you did not receive your transfer vouchers with your travel documents, you will be on the manifest and greeted at your arrival airport by one of our representatives. If you choose to make your own air arrangements or book air through our online ChoiceAir Travel Program you may wish to purchase ground transportation to the ship. Transfers are available for purchase from the arrival airport to the pier on day of sailing and from the pier to the departure airport on debarkation day only. It is recommended that transfers are purchased two weeks prior to sailing. Please remember we require your flight information in order to promptly meet all guests. To purchase your Royal Caribbean Guest Transfer or for additional information consult your travel agent or our Reservations Department at (800) 327-6700. Is there parking available at the Royal Caribbean port cruise terminal? Most ports have parking lots and garages for cruise guests for a minimal fee. It is on a first-come first-serve basis. Every pier does vary. It depends on the specific itinerary of your cruise, your nationality, and various United States and foreign laws. Joining the cruise at one of its ports of call or leaving the cruise prior to its scheduled termination point may be prohibited by law. If you need to join late or leave early, or both, submit your request in advance and we will tell you whether your proposed changes will be permitted. There is a cut-off date for submitting this information, so make you submit your request early. Please note that no refunds, prorated or otherwise, are granted to customers who join their cruise late or leave their cruise early. Certain governments impose fines or other charges when a guest permanently disembarks from a cruise before its final port of call. The guest will be responsible for those charges. Guests who have already booked a flight can book a transfer with Royal Caribbean. If you miss the departure of your trip due to carrier-caused delays or other covered reasons, Royal Caribbean Travel Protection Program package of benefits reimburses you for additional accommodations, meals and “catch-up” transportation expenses. Otherwise, you are responsible for any expense incurred to meet the ship at its next port of call. For this reason, many guests find it is easiest to arrive a day prior to sailing and stay in a hotel the night before to avoid any possible delays. If guests are pre-approved for boarding/departure in an alternate port of call, the ship’s security staff is notified to expect the guests at the designated port. The approved guests are responsible for making all travel arrangements and will incur any additional expenses (for flights, hotels, transfers to the pier, etc.). Prepaid gratuities will be added to all approved reservations for the length of cruise. If a passenger (as listed on a vessel passenger manifest) embarks in a U.S. port and the vessel calls in a nearby foreign port (such as Ensenada, Grand Cayman and Nassau) and then returns to the U.S., the person must disembark in the same U.S. port. A passenger who embarks and disembarks in two different U.S. ports (such as Los Angeles and San Diego) would result in the carrier (not the violator) being fined. The vessel must call in a distant foreign port before the U.S. embarkation and disembarkation ports can differ. The nearest distant foreign ports are in or off the coast of South America. If either the passenger’s embarkation port or disembarkation port is in a foreign country, then the provisions of this cabotage law do not apply. Nor do they apply in Puerto Rico and the U.S. Virgin Islands. On the final morning of a cruise experience in most countries all guests must leave the ship before the guests joining the next cruise can board. In most environments the latest time to leave the vessel will be between 10:00am and 11:00am. Each ship will provide an as you depart flyer with the exact details for that vessel and port of boarding. For guests who have purchased air, hotel and cruisetour packages through Royal Caribbean, transfers will be provided. If you have made your own air and hotel arrangements, you will be responsible for that transportation to the airport and/or hotel. For cruise-only guests, we offer Royal Connections transfer service. Please contact your travel agent or our Customer Sevice Department for complete details. Guests can board the ship based on their published check-in windows, if applicable, or during general boarding which depends on the ship’s sail time. All guests must be checked-in 60 minutes prior to scheduled sail time.